The occasion was dinner with my husband and a friend from out of town who was staying with us. She is a wine aficionado and the restaurant is located five minutes from our house. The restaurant was smaller than I expected, however, there is a large patio for alfresco dining. We chose to dine indoors, given the slight chill of spring. The menu offers several soups, salads, a handful of appetizers, and 9-10 entrees, not counting the nightly specials. For the wine lovers, there are a variety of meats and cheeses to accompany your wine selection. There is an extensive Wine List which offers a per bottle discount if you join their Wine Club. The Club offers three different levels of memberships and benefits. 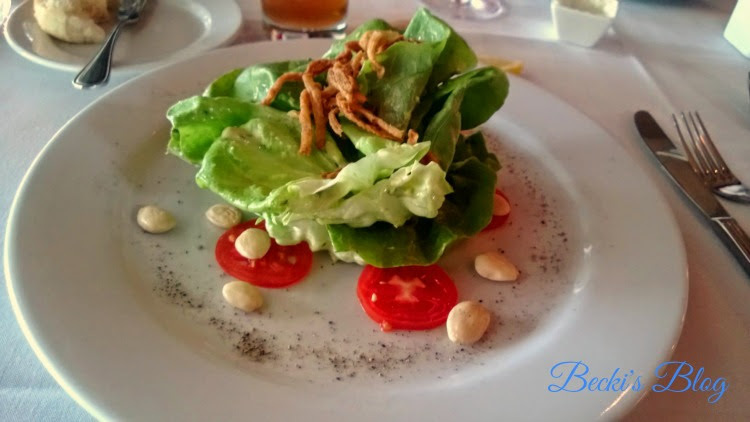 For starters, our house guest and I chose the salad: Kentucky Limestone Bibb, Marcona Almonds, Tobacco Onions, and Scallion-Ginger Vinaigrette. They were excellent. My husband chose the soup of the day which was Cream of Asparagus. He said it was very good. 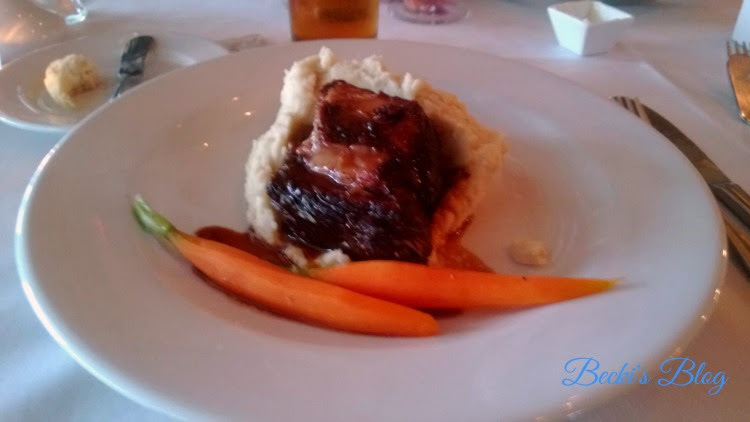 For the main meal, I chose the short rib with potato puree (mashed potatoes) and bordelaise sauce (gravy). I opted to switch the snap peas side dish for carrots. The short rib was tender, but very fatty, enough that I could only eat one of the two rather small pieces of meat. The mashed potatoes were fine, but the carrots were not cooked at all. Further, my plate was only lukewarm when the food arrived. 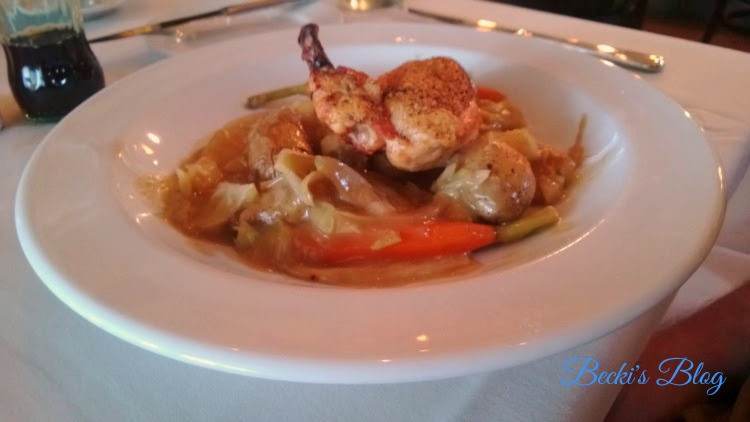 My husband chose the Crispy Skin Chicken Breasts served with Baby Carrots, Fennel, Savoy Cabbage, Fingerling Potatoes, Chicken Velouté (broth). Again, the carrots were not cooked at all. He liked his selection, though. It resembled a chicken stew of sorts. Our house guest chose the Seared Duck Breast served with Goat Cheese Soufflé, Raspberry-Cassis, Reduction, and Haricots Verts (green beans). She raved about the excellence of the duck. 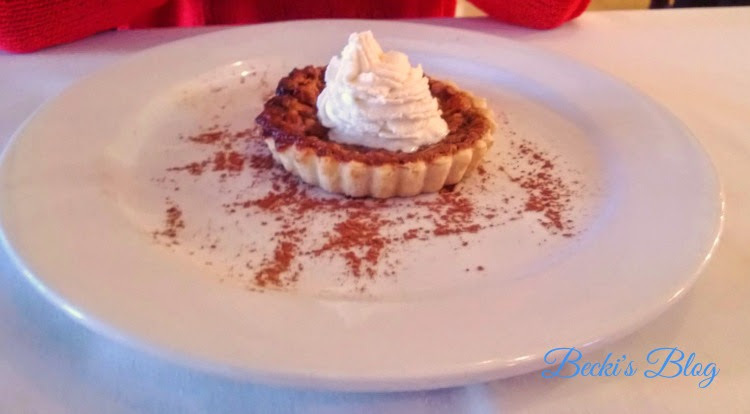 All three of us shared one dessert: A Chocolate Bourbon Tart with Black Walnuts, KY Bourbon, and Vanilla Bean Whipped Cream. It was delicious! Our house guest picked up the check, but I estimate it was around $125 including tax and tip. Service was slow. The bistro was crowded since Keeneland is in session, but there was only one server for the entire dining room. Given how long we waited for our meal, I expected mine to be hot! I had high expectations from a restaurant of this caliber, especially given the price tag, but I felt that they fell short in several key areas. However, it is a romantic location for special events. The dining room was nicely appointed with a great view of the vineyards from our table. The atmosphere would be a great venue for a wedding reception.